Who was W.S. Graham? What will be your new language? Are you going to try your best on silence? To celebrate W.S. 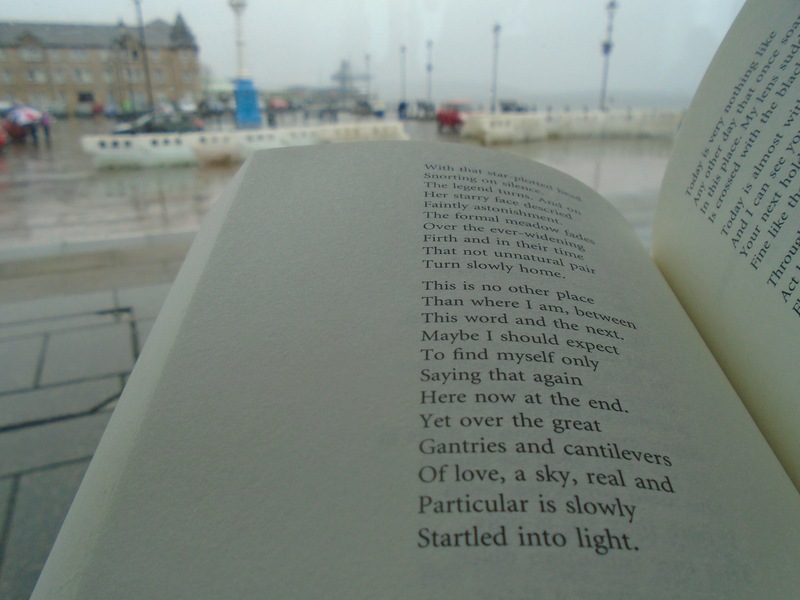 Graham’s centenary, we’re searching for poems inspired by his enigmatic and inviting work. Poet Rachael Boast introduces WSG and offers prompts to kick-start your writing in this new challenge. Princes Pier. Photo credit: Rachael Boast, May 2017. To hear you speak in your new language. This year is William Sydney (“I answer to Sydney”) Graham’s centenary and we’re having a party to celebrate. A party which will last the entire year. We think Graham would have liked that. This challenge – to write a poem inspired by W.S. Graham’s work – is a way of inviting you to the party. 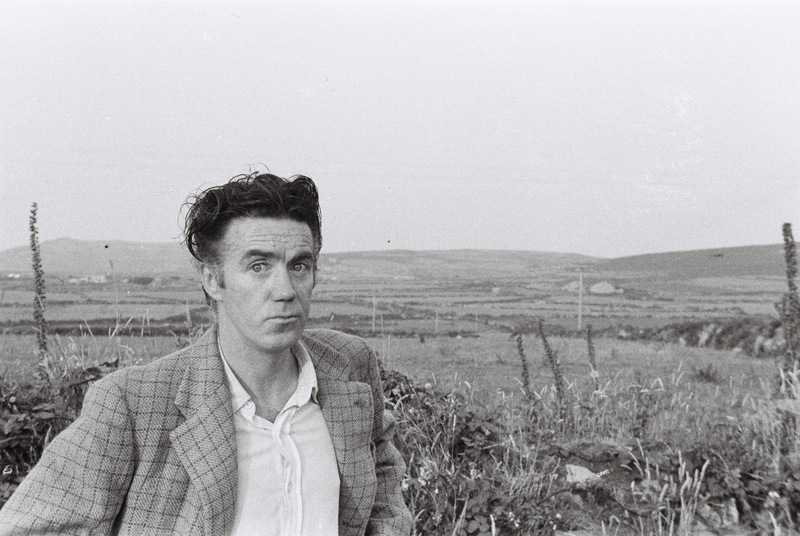 Born in 1918 to a working class family in Greenock, Scotland, Graham started out as an apprentice draughtsman for a Glasgow engineering firm and eventually became one of the most greatly admired poets of the twentieth century. How did he do this? Well, he worked hard at his craft, was largely self-educated, lived modestly, read widely and made strong friendships with other writers and artists with whom he could discuss his interests. You can read a short biography of W.S. Graham here, and a longer one here. Key themes of his poetry are the difficulty of communication, the need for humour and the importance of community. Graham creates a community within language. He says, ‘language is where the people are’. W.S. 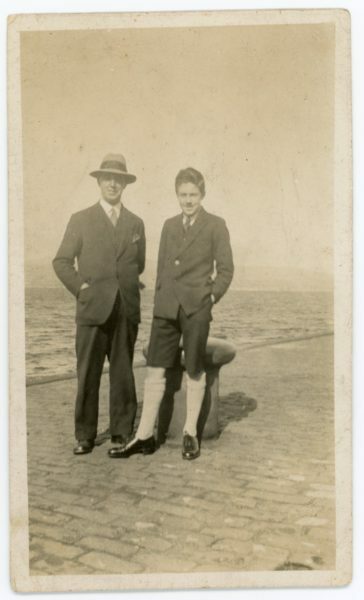 Graham with his father, Alexander Graham, Princes Pier, Greenock, 1933 (photographer unknown). So here we are. You are reading this as I speak into the silence between where you are and where I am. I am writing this to construct a space for you to think into. There, we’ve got the conversation started. Graham was very fond of talking to his reader and will (you’ll discover as you read his poems) even address you directly. He wants your ear. Where am I going now? Words of my later life? And what has happened to you? We’re going to give you two prompts for this W.S. Graham writing challenge. We will call him WSG from now on. These prompts are concerned with language itself as a theme and are not about issues or current affairs. They are a way of getting you to deepen your feel for language, and for words, their individual sounds and shapes on the page. The idea is that your sense of language as something that is alive and sensitive to what you do with it will be enhanced, whatever you chose to write. It is difficult to know what the poem is going to be but that’s all part of the fun. A note on writing exercises: it is preferable to write longhand, whether you’re used to it or not, pen to page. You may find that the feeling of this method of communication is more your own, and secret. No one has your handwriting. It can also mean that you say things differently, or work more slowly. All this is for the best. The page, and the feel of the page is important. It might help you find your way deeper into the poem. Writing by hand creates a different space in which to practice your concentration. Get used to crossing things out as part of the process; it provides a record of the poem and there’s no shame in lines and phrasings that are helping you to warm-up your imagination, your own space in which to think. 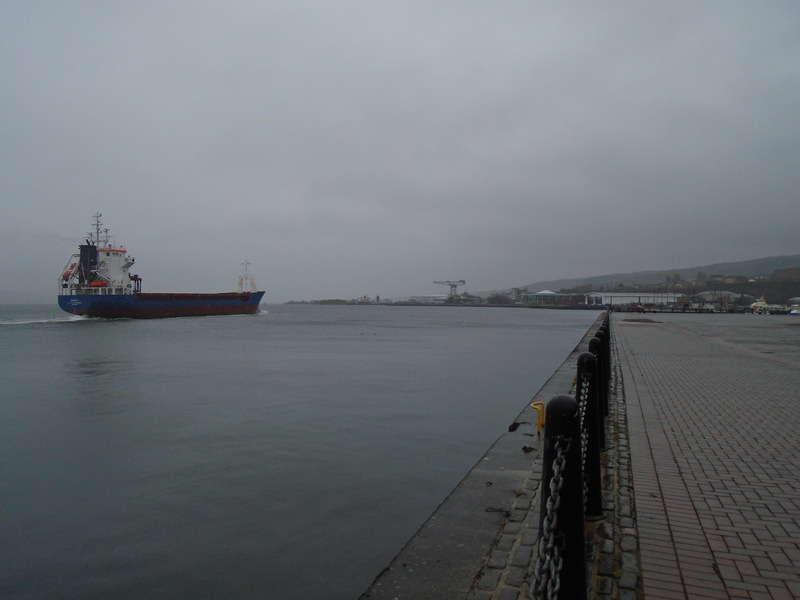 Customs House Quay, Greenock, with WSG poem. Photo credit: Rachael Boast, May 2017. Shut up. Shut up. There’s nobody here. On silence on the other side…. Read WSG’s poem ‘The Beast in the Space’ and think about what there might be on the other side of the words. What lies behind words? What lurks between writer and reader? There are many references to creatures in WSG’s poems and he often imagines language as a sort of creature. Here it is a ‘beast’ and the poet must balance caution with enterprise to get the beast which is language to behave itself on the page. Write a poem in which language is personified as a creature of your choice and imagine what it means to work with it. What mood is it in? How does that affect the poem? Imagine a particular space for the poem’s setting. It can be outdoors or indoors but wherever you set it, see if you can make the creature speak and say something back to the reader. Whilst the poem is an inanimate object, make it a home for an animate living creature. Consider the different options for the name of your creature. It could be a real creature’s name or a variation on one, or a colloquial or cultural name, or a mythical name, or a compound name (made of two words or more) or something you made up entirely. If you want you can write about the experience of writing the poem, about something relating to communication as a theme. Or you can just see where the poem takes you. If you need help starting the poem, find your own way of imitating how ‘The Beast in the Space’ starts, with an instruction to the reader, and notice that WSG finishes his poem by referring back to where it started. Perhaps your creature will be there in the poem at the start, or perhaps it will only make an appearance in the last few lines. That’s fine. Look out for other creatures in WSG’s poems. They’re always up to something. Above all, be surprised. That means the poem is going well. Pleasure however we stretch the word. About. Neither hot or cold. Its sensual impact is almost nothing. Over the bank of this last line. W.S. Graham with Gurnard’s Head behind him. Photo credit: Michael Seward Snow. Above the line of the sea. Not wanting to be a symbol. Read WSG’s poems ‘Enter a Cloud’ and ‘Imagine a Forest’. Read them aloud to yourself. Reading poems aloud helps them make a deeper impression on us. Even better if you can memorise a poem. In both these poems WSG is allowing a particular place to enter his imagination. His observations may be fictional or they may be real. He was living in Cornwall when he wrote these poems (Zennor is a small village facing the Atlantic, and Zennor Hill is visible from Gurnard’s Head). 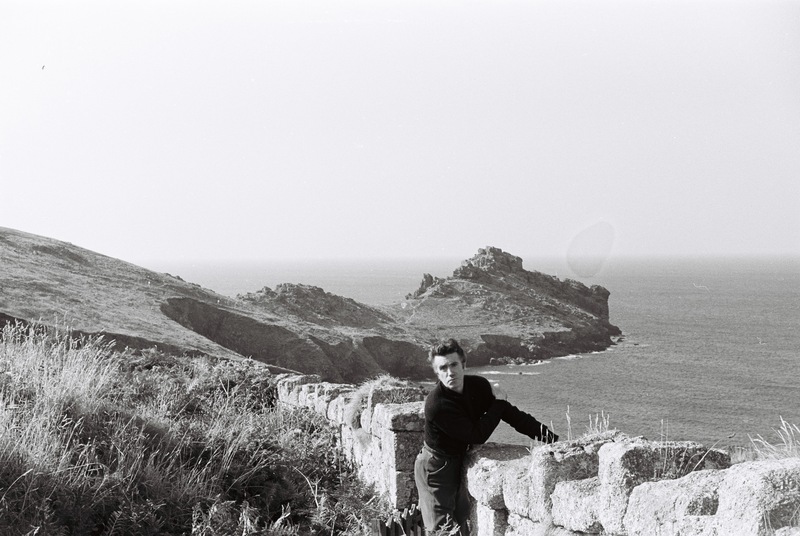 It’s a rugged landscape and many of WSG’s poems can also feel rugged; as a Scot he would have appreciated the similarities between Cornish and Scottish landscapes and seascapes. He can make a poem sound like how the landscape, or seascape, looks. His use of syntax – how words are arranged to form a sentence – often sounds very ‘craggy’ because he deliberately disrupts the expected notions of how a sentence might be constructed. Why does he do this? He does it in order to create particular rhythmic effects, to hold the reader’s attention and to heighten the intensity of the poem. It is much more interesting to be made to wait until the end of a sentence to figure out what is being said, and WSG is enjoying the way his unusual syntax plays with the reader’s expectations. You might like to try something similar. Write about a feature of nature you might imaginatively enter into. This could be something or somewhere you know and visit or something or somewhere invented. It could be above your head or below your feet. If it is above your head, consider the abstract quality of air, for instance, its associations, its use as a motif in other poems. Think about other definitions of ‘air’, as a noun or as a verb. Look them up if you don’t know them. If it is below your feet, think about the sounds and textures of words associated with earthiness; think of words like ‘hidden’ or ‘ancient’, ‘strata’ or ‘surface’. Look up the origins of the words you use. This is etymology. Being aware of where words come from, how they arrive into English from other languages, may influence which words you choose to use and how the poem sounds. The ‘sound’ of the poem is as important as the ‘sense’, as what is being said. Some people work on a poem preferring a ‘sound’-based technique over a ‘sense’-based one, others prefer it the other way round. This exercise entails an act of empathy (‘feeling-with’ or ‘being-with’), of being still and listening and looking. If you like you can use WSG’s title as a model for your own title. However, it must contain a verb and a noun, as in ‘enter’ and ‘cloud’, ‘imagine’ and ‘forest’. Wherever you go with your poem, enter as best you can that thing or place you have chosen, enter very quietly so as not to frighten language away, and make something happen there. W.S. Graham with Zennor Hill behind him. Photo credit: Michael Seward Snow. Kindling up and breaking its sticks. He thought he lay there dying for. We want you to write a poem inspired by WSG’s work to celebrate his centenary. We’d love to read poems inspired by the prompts we’ve included, but if you’d like to respond to a different aspect of WSG’s work or one of his other poems, do feel free. You may want to look at the centenary anthology, The Caught Habits of Language: An Entertainment for W.S. Graham for Him Having Reached One Hundred (Donut Press, 2018) which includes twenty previously unpublished poems by Graham, along with tributes from a wide range of authors. Winning poets will have their poems published on Young Poets Network and receive an exclusive Young Poets Network notebook, as well as a copy of W.S. Graham’s New Selected Poems. There may also be a chance to read at a W.S. Graham centenary event later on this year at The Poetry Café. This challenge is part of the project ‘Language is Where the People Are’, Estate of W.S. Graham, supported by the National Lottery through Creative Scotland. All poems © The Estate of W.S. Graham, 2018. All rights reserved. Rachael Boast was born in 1975 and is the author of three collections of poetry published by Picador: Sidereal, Pilgrim’s Flower and Void Studies. She is co-editor of two anthologies, The Echoing Gallery: Bristol Poets and Art in the City (Redcliffe Press 2013), and The Caught Habits of Language: An Entertainment for W.S. Graham for Him Having Reached One Hundred (Donut Press, 2018). Hello! This is such a wonderful and inspiring challenge! Is there a line limit for the poems? Thanks for your lovely comment and your interest in the challenge! No, there is no line limit in this particular challenge. We can’t wait to read your entry.